EXQUISITE! LIMITED EDITION SALVADOR DALI SIGNED LITHOGRAPH. This is the VERY RARE Stunningly exciting Surreal Dalis SURREAL COLORFUL Print, by one of the worlds most intriguing and dynamic artists of all time. Own one of his most sought after rare works. This piece is extremely difficult to find!. This print features breathtaking rich colors and an amazing Surrealist composition. Features a wonderful sensuous composition in an explosion of wonderful colors. Original Limited Edition Lithograph & Collage on paper, 1975. Edition Size: 250 Arabic Numerals on Arches paper, 250 (I = International) Arabic Numerals on Rives paper, 75 Roman Numerals on Japon paper, and 25 Roman Numeral proofs (EAs) on Japon paper. Paper Size: 30.25" x 22." Signed and numbered in pencil by the artist. Excellent Condition; never framed or matted. Published by Merrill Chase Publishing Associates. Field's Catalog Reference #: 75-11, F. Certificate of Authenticity included. Suggested Retail Gallery Price: $3,500. SALVADOR DALI (1904-1989) Salvador Dali was born Salvador Felipe Jacinto Dalí y Domenech in Figueras, Spain, on May 11, 1904. Spanish painter, sculptor, graphic artist, and designer, Dali joined the Surrealists in 1929 and his talent for self-publicity rapidly made him the most famous representative of the movement. Salvador Dali is considered as the greatest artist of the surrealist art movement and one of the greatest masters of art of the twentieth century. Extraordinary Lincoln in Dalivision, Ltd Ed Giclee, Salvador Dali - LARGE! Click the button below to add the Fab! 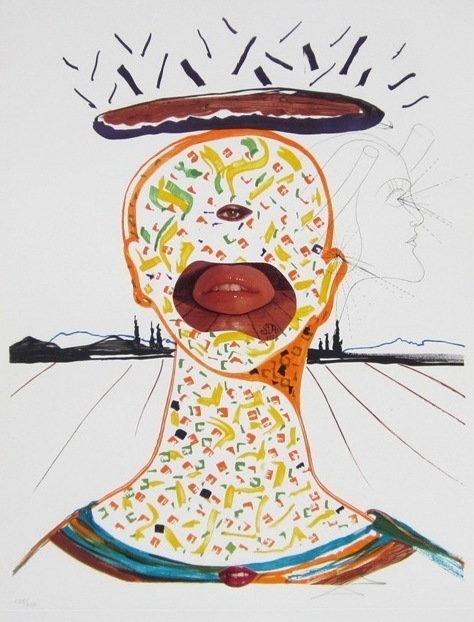 Cyclopean Make-Up, Ltd Ed Mixed Media (Lithograph & Collage), Salvador Dali to your wish list.